Fun, Food, Drink, And Adventure! A thousand miles north of Napa lies Canada’s Okanagan – a favorite of locals for sun-soaked summer getaways. It’s an arid wine region of soft sandy beaches, clear blue lakes, and distant mountain valleys. On this six-day adventure, you’ll sample your way through the region’s best wineries and farm-to-table eateries and enjoy your choice of adventure activities. Due to the Okanagan Valley’s diverse landscapes and growing conditions, you’ll discover a variety of wine types from delicious reds to lively, crisp whites. Explore everything from funky, boutique vineyards to premiere operations. It’s your getaway, so you choose the pace! If you’re feeling active, choose a winery tour. If you feel like kicking back, enjoy a sailing tour on one of the Okanagan’s beautiful lakes. Ask us more about the exciting activity options on this trip. Hop in a car and venture away from the main tourist region, into less-known wine country. 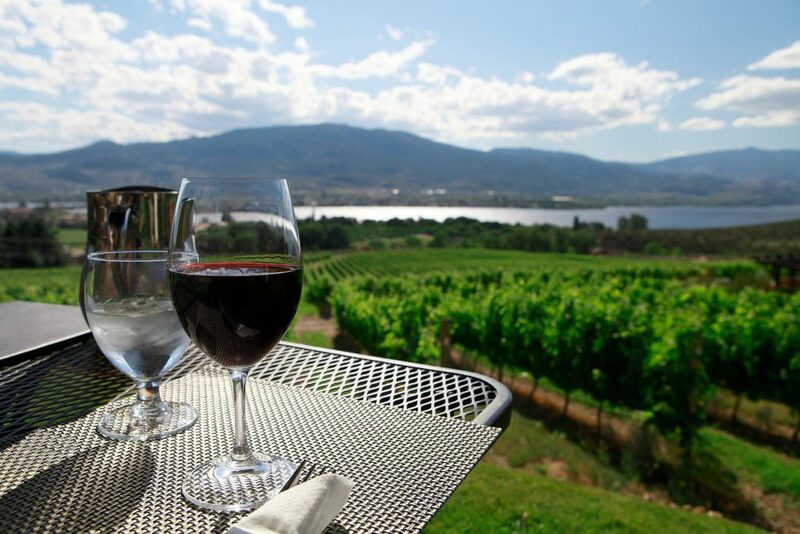 The Osoyoos area is home to some of the most sought-after boutique wineries in Canada, and beautiful scenery to boot. Welcome to Kelowna, ideally located deep in the heart of the Okanagan Valley. On the eastern shore of Lake Okanagan, it is surrounded by provincial parks, pine forest, vineyards, orchards, and mountains. Kelowna is the largest city in British Columbia’s Okanagan Valley. Bordering Okanagan Lake, Kelowna is well known for its hot summers and temperate winters. Urban and rural; nature and culture; playtime and downtime. Kelowna isn’t just one destination, it’s a whole bunch of them located in one uniquely beautiful place. While you're in Kelowna, check out the energetic downtown and beautiful waterfront boardwalk. Go on a tour of the many local Okanagan wineries, craft breweries, cideries, and distilleries. Hit the trails by bike, visit the historic Myra Canyon Trestles, or hike to the top of a mountain. Relax by the lake at one of the many beaches or take to the water for endless lake activities. Enjoy the freedom of exploring by vehicle. Your rental includes a GPS, loss damage waiver, unlimited mileage, and one additional driver. Overnight at the Manteo Resort Hotel. Situated on the shores of Okanagan Lake just 15-minutes from Boyce-Gyro Beach Park, the beachfront resort offers upscale accommodation and plenty of activities for the whole family to enjoy. During your stay you will have access to an on-site restaurant, fitness centre, sauna, indoor and outdoor pools, tennis courts, a waterslide, games rooms, putting green, and more. Set out and explore the amazing scenery! With beautiful sandy beaches, gorgeous vineyards, towering pine trees and desert landscape, it is like no other place in Canada you can enjoy the best of everything in one place. Experience the scenic rolling hills, vineyards, orchards and panoramic lake views on a wine tour in Kelowna, the birthplace of wine making in BC. Rustic picnic lunch included. Discover the Myra Canyon trestles by bicycle on this exciting 4-hour guided tour. This historical wonder of the Kettle Valley Railway is a 24 km tour that will take you across 18 trestles and 2 tunnels. Head out to explore the Okanagan and all the beauty it beholds. Visit the small streets in downtown stopping in at the local cafes, markets and restaurants or take a leisurely stroll along the lake on the cities beautiful boardwalk. Today you will enjoy the experience of a lifetime on the beautiful Lake Okanagan. Your vessel for the day is a fully equipped 26' MacGregor sailboat. Get a taste of peaceful solitude and see how it feels to slice through the sparkling waters with just the ripple of the sails. It is a perfect way to sight see, relax, and soak in all that Kelowna and the area has to offer. Up up and away! Begin your morning with the sun as you rise with your pilot in a majestic hot air balloon above the Okanagan. Enjoy the scenic drive south today along the lakes edge to Osoyoos. On your left you will pass by Lake Okanagan and Skaha Lake where people flock from all over to enjoy their warm waters and sandy beaches. No drive south is complete without a stop at the local fruit and ice cream stands. If you have time, make sure to pick up a bottle of wine from one of the many wineries you pass by to enjoy later this evening. Set against stunning Osoyoos Lake and surrounded by arid desert and grasslands, visitors come to Osoyoos for water activities, golf, hiking and cycling in summer, and for downhill skiing, snowboarding, cross-country skiing and snowshoeing in winter. The call of the outdoors is irresistible here. Our tip for Osoyoos: About 8km west of town on Hwy 3, you’ll find Spotted Lake, a unique natural phenomenon that hold significance to the local First Nations community. In the hot summer sun, the lake's water begins to evaporate, causing its high mineral content to crystallize and leave white-rimmed circles of green on the water. Although access to the lake is restricted, you’ll get excellent views of this natural wonder as you approach from the highway. Overnight at The Watermark Beach Resort. This hotel offers spectacular views of Osoyoos Lake and you’re steps to everything: beach, dining, and a small marina! Stretch out on a secluded beach, or lounge on your balcony or the hotel sundeck. Sip a variety of wines and try the tapas served on the hotel patio of you wish! Amenities include complimentary WiFi, complimentary secured parking, fitness studio, salt water pool with waterslide, steam rooms and sauna. With its desert landscape, rolling hills, multitude of vineyards to choose from and the sandy beaches that surround the city, you can’t ask for a better location to relax and unwind. The temperatures in the summer months are unbeatable, along with the local ice cream shops! This tour is for the true wine lover. You have a choice of the wine regions: The Wineries of the Okanagan Falls, Similkameen Valley, or the Golden Mile / Black Sage Road. Sip, savour, dine, learn, make new friends and most importantly, have fun! Enjoy an educational and entertaining experience today as you join your knowledgeable guide on a tour of an operating 650 acre farm. Learn about the sustainable farming practices while you enjoy the freshly grown produce, charcuterie and wine made right there. Much too soon, your British Columbia adventure comes to an end. Make your way back to the Kelwona to drop your car off at the airport and board your flight home. Ask your Sales Advisor about adding on more time to explore and relax in the sunny Okanagan area. Below you'll find examples of this trip's accommodation options. Please call us for the full list or advice on how to customize your experience. Let's personalize this trip idea with your own flair so that it's unique to you. We're always here to open up possibilities and clear up uncertainties. We're with you every step to help you plan and enjoy your trip, and get you home safely. To make sure that your holiday is full of only good surprises, here's a comprehensive list of what is (and isn't) included in your package. This trip is available for departures between April and September. based on double occupancy, April 2019 departure and our base class. We offer a range of packages across all four seasons. Please speak with one of our travel advisors about personalizing your trip and getting a comprehensive quote. We’ll connect with you shortly by email or phone to finalize your free trip plan.